Grandmother Donna’s playing at the Park Theatre in Youngstown, Ohio reminds me that not everything is on the Internet. It is only by luck and happenstance that I learned of “Chin-Chin” being in Youngstown at all. 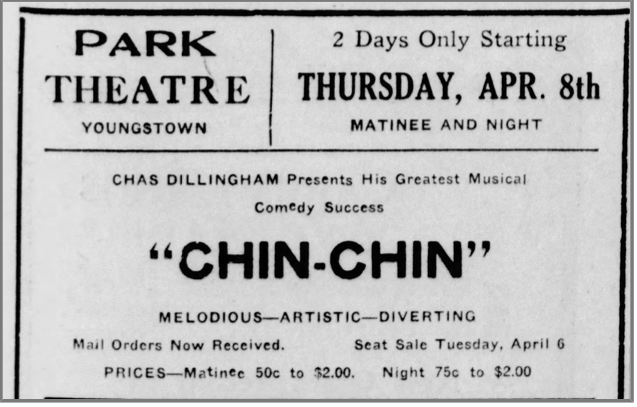 Last summer, I was researching for “Donna in New Philadelphia, OH, at the Union Theatre – 10 April 1920” and ran across an article via Newspapers.Com, that “Chin-Chin” had also played in Youngstown at the Park Theater. It was really nice to know of another venue for the show. I was excited to look at that showing later. I finally had a chance to research the show’s presentation in Youngstown and I couldn’t find much more. After going through my regular sources, Newspapers.Com, Genealogy Bank, and Ancestry.Com, I only had one small ad. Everything I did find came from the Salem News, in Salem, Ohio, about 25 miles away from Youngstown. Nothing from a Youngstown newspaper. Next, I needed to see where those newspapers might be available. My favorite site to look for newspapers is The Ancestor Hunt. I went there and did a quick search for “Ohio.” The first of the responses to the search (that weren’t ads) was Ohio Online Historical Newspapers Summary – Exactly what I was looking for. A search for Youngstown yielded three items. McKinley Memorial Library – Youngstown Telegram – The link didn’t appear to work. After a couple minutes, it finally loaded the page. They had a browse by title button, I clicked it and then learned that the only year they have for the Youngstown Telegram was 1918. No help there. Next, was a link to Google News. There were many issues of the Youngstown Evening Vindicator before May 1893, but nothing from 1920. Finally, was another link to Google News. There were many issues of the Youngstown Vindicator available there. Several papers from March, and April 1920 were available, but many others were missing. I looked at the March 27th image. Page 4 was clearly the Amusements page, but there was nothing there about “Chin Chin” that I could discern. The next paper available on Google News was April 18th, well after the show. The Ohio Historical Society has Microfilm for the Telegram from 1901 to 1936. The Ohio Historical Society has Microfilm for the Vindicator from 1893 to 1936. So, I am reminded that not everything is on the Internet and that visits are important. Time for a road trip to Ohio. Donna and the cast of “Chin Chin” played at the Faurot Opera House in Lima, Ohio on the 6th of April 1920. We don’t know where Donna played on the 7th, but we now know that she did play the Park Theatre in Youngstown, Ohio, on the 8th. Lima and Youngstown are about 200 miles apart, so I suspect there was another location they stopped along the way. The article mentions that the show will be “one night only.” However, an advertisement for the Park Theatre indicates [erroneously] that it will show “2 Days Only.” It was only there for two shows, not two days. “Chin Chin” played at the Victoria Theatre in Steubenville the following night (April 9th). Today, the site is the location of the Youngstown campus of the Eastern Gateway Community College. 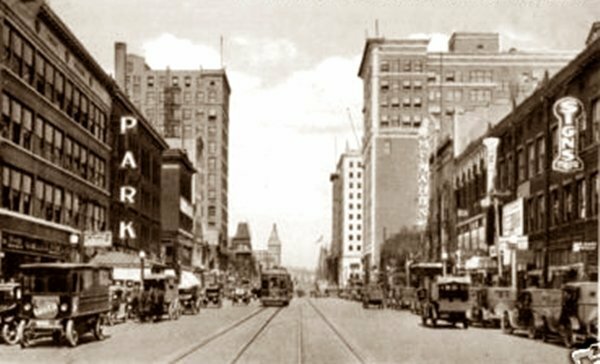 Nearby hotels suggested by 1922 Julius Cahn-Gus Hill guide included the Tod House, Colonial Hotel, Salon Hotel, and the Vanier Hotel. The railroads serving the city were the B. & O. and the Erie, Penn. Visit the Ohio Historical Society and review their microfilm for the Youngstown Vindicator and the Youngstown Telegram for April 8th, 1920 plus 14 days before and two days after for information, articles, advertisements, and reviews of “Chin-Chin.” Note: Mahoning Valley Info Forums indicated that the Main Branch of the Youngstown Library also has the Vindicator microfilm. Need to confirm before going. [ii] “Census of Population and Housing.” United States Census Bureau. Per Wikipedia. Next Next post: Why I’ll never do business with MyHeritage again.